Discover Denver one bite at a time on this three-hour walking food tour through downtown. You'll visit 6 local restaurants for delicious tastings and behind-the-scenes access to kitchens and chefs. In between tastings, your experienced local guide will share stories about Denver's rich history. From secret tunnels to world-famous bordellos, learn just how wild the west was in the city's early days. You'll visit historic sites and landmarks like the city's oldest jazz club, the baseball stadium, the Dairy Block and the iconic Union Station. Meet your experienced foodie guide near the ballpark in downtown Denver. Your group will start with introductions and an overview on the tastings and tour format for the day. As you walk to 6 different restaurants for tastings, your experienced local guide will offer an insider's look into the city's food scene, history and architecture. You'll enjoy behind-the-scenes access to some of the best restaurants in Denver. At each stop, you'll learn about the chef, what the restaurant is known for and the tasting you'll enjoy. You'll visit a nose-to-tail butcher that sources meat from local farms, enjoy a slice of authentic Neopolitan pizza from the only pizzeria in Colorado certified by the Associazione Verace Pizza Napoletana in Italy, taste a gourmet hotdog from one of Forbes' top 10 hotdog joints in the country, sample farm-fresh sheep milk cheese featured on the Bravo show Top Chef and visit two restaurants run by James Beard award-winning chefs. In between food tastings, you'll visit historic sites and landmarks in Denver including the city's oldest jazz club, the newest micro-district downtown, and the baseball stadium. Your tour will end with a sweet treat inside Denver's iconic Union Station. 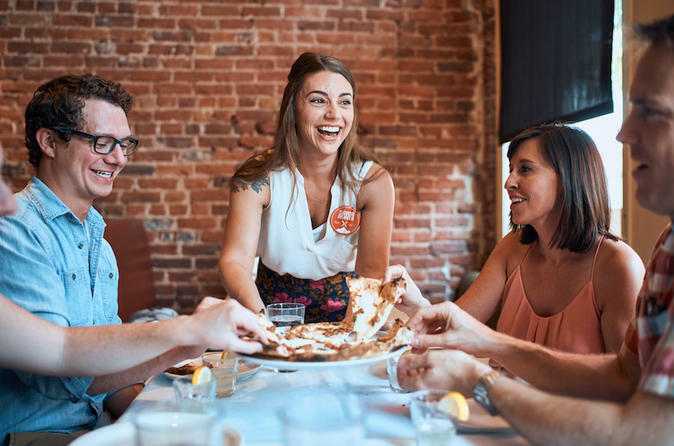 After the tour, all guests will receive our Insider's Guide to Denver Dining with additional recommendations for the best places to eat and drink in Denver.